Thanksgiving is looking up for Natalie Dubose, the Ferguson entrepreneur whose bakery was trashed by rowdy protesters overnight Monday. 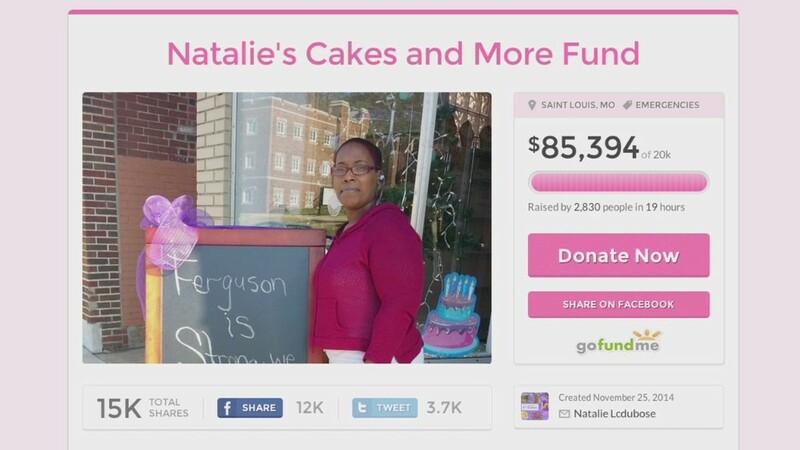 Dubose owns Natalie's Cakes and More, and has raised more than $84,000 since creating a crowdfunding page Tuesday afternoon to rebuild her business. "I think I cried so much, I shouldn't have any more tears," she said. Dubose, a single mother of two children, just opened for business in June and raised her start up funds through bake sales at flea markets. She said she put everything she had into the bakery, and was devastated to discover that vandals had smashed in her shop windows during violent protests in the Missouri city of a grand jury's decision to not charge police officer Darren Wilson for fatally shooting Michael Brown. One window was "completely destroyed," she said. Broken glass was scattered throughout the front of her shop, contaminating much of her supplies and packaging. But she started baking anyway on Tuesday morning, partly because she didn't want to let down customers with Thanksgiving orders, and partly because she couldn't afford to cancel the work. Good Samaritans stopped by throughout the day, helping to clean up the glass and board up the windows. "Now the front of my shop is decent," she said. She also got a call from a woman who wanted to donate money, and who instructed her on how to set up a page on GoFundMe, a popular crowdfunding site. "I never ever heard of a GoFundMe," she said, adding she never would have expected so much in donations, especially in such a short amount of time. As the clock counted down to Thanksgiving, she kept the oven busy with apple, pumpkin, blue berry, cherry and caramel apple pies, plus pound, caramel, cinnamon raisin pound, strawberry short and split lemon cakes. Dubose said she has been emotionally overwhelmed by the way people have treated her, first by the damage done to her shop, and then by the outpouring of support. "I guess that's why I was so hurt with the damage that was done to the place, because I genuinely love people," she said.